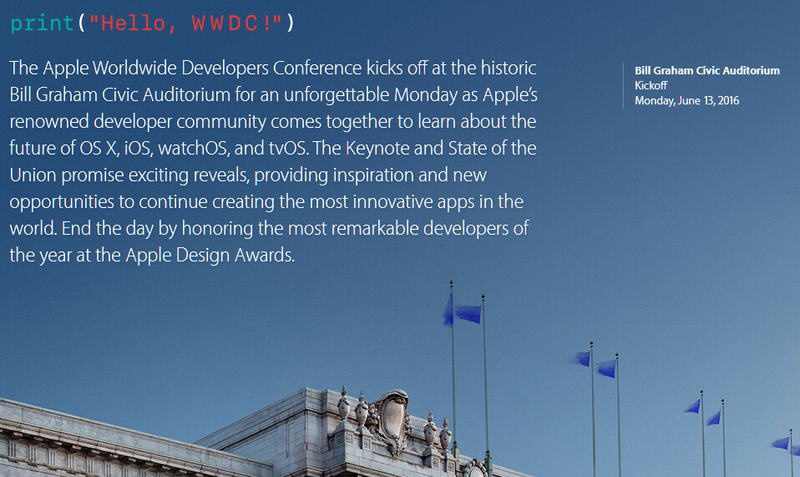 Apple will be holding its Worldwide Developers Conference June 13-17 in San Francisco's Moscone West center, while the kickoff session on Monday will take place in the Bill Graham Civic Auditorium there. The funny part is that Siri slipped the conference dates inadvertently when someone asked it, before Apple had even taken the WWDC 2016 website up at all. Earlier yesterday, Siri still didn't disclose the dates, replying that the conference hasn't been announced yet, but by the afternoon it was already dishing out the dates that Apple confirmed officially later on. 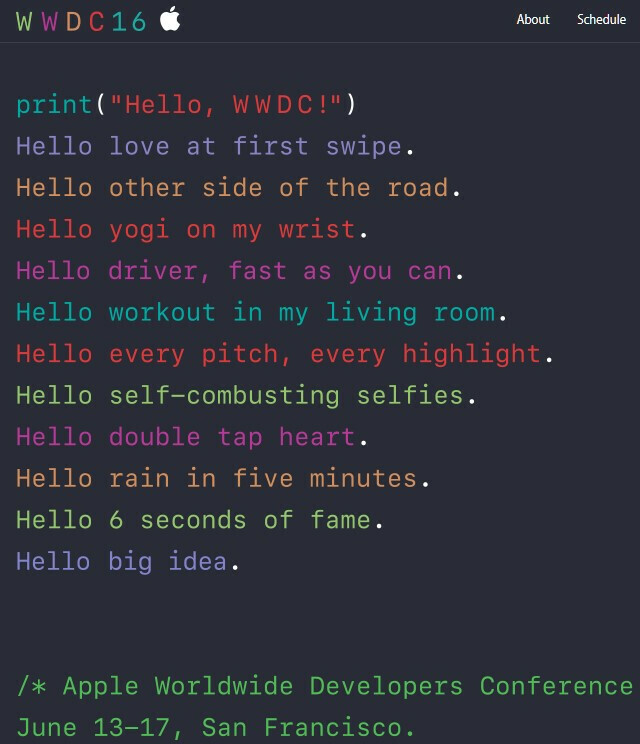 It's all about software at this WWDC event, as it should be, as the teaser images and the website styling are executed in a colorful lines of code, while the narration you see on the right hints at the possible topics for developers and future iOS edition features. What, iOS may sport self-destructing selfies and live adverse weather alerts? Well, your guess is as good as ours, but there will seemingly be a little something for the drivers, a bit more for the fitness fans, and big ideas. Tune in on June 13 when the keynote kicks off at 10am Pacific, and we will tell you all about the ongoing iOS festivities. Whatever that Apple announce will be a sad Excuses and sad jokes of so called innovation show nothing but blissful ignorance. From his amazing grammar I'd take a guess that he's a 10 year old who got a pic of Uncle Phil from The Fresh Prince to use as his avatar. Your post is a fine example of "ignorance". At least wait till after the announcement to criticize. That and the retina macbook air. Fingers crossed. 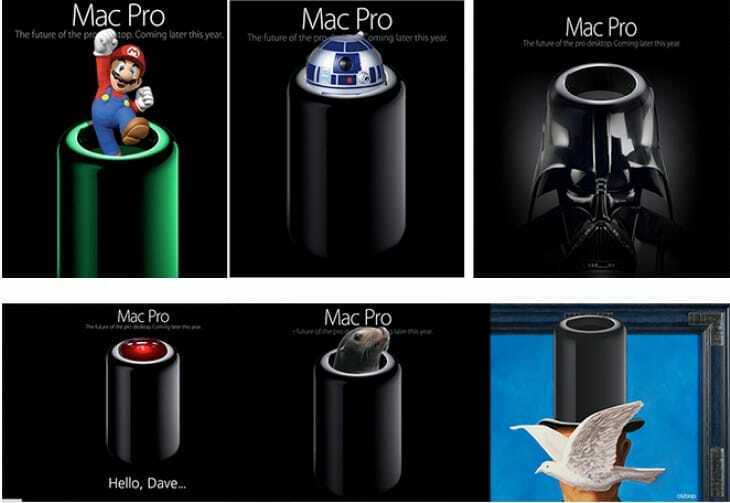 Never liked those, or the iMac. You can build a much more powerful PC for a third of the price. And run hackintosh as well as windows on it. Heck, I can make a workstation with ECC memory, Xeon and Nvidia quaddro for much less if you want to run maya or something which only uses hardware acceleration with workstation cards. but, but, but... it doesnt have the apple logo on it... btw, now is the worst time to build or buy any pc/workstation.. since 14nm nextgen graphic cards will come soon, and 10nm DDR4 RAM, and 10nm intel chipset, and OLED monitor will become mainstream..
Pascal and broadwell-E is releasing this summer. Tagline should be "what will we steal next?" Self-combusting selfies?? They already developed self-combusting devices. its just a new flash for selfie, since lots of android have front flash already... but this one come with a twist... and boom..
6 secs of fame. Vine? Self-combusting selfies... My guess a snapchat like feature.. Where you can send selfies to your contacts and it will "self-combust" in a set number of seconds. uhhh.....Should we laugh or something? Because you're the owner of that comment and you genuinely typed that? Apple Watch C? iPhone 6C?